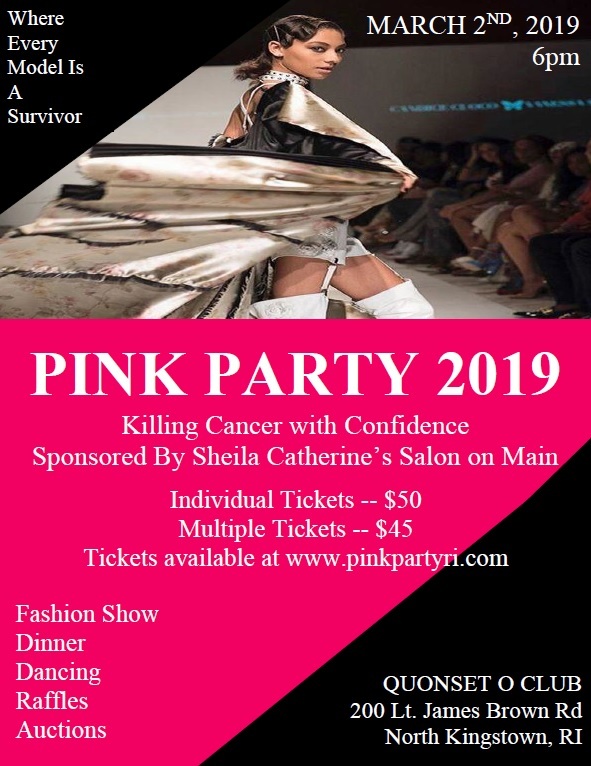 Pink Party 2019 is an incredible fashion show to raise funds for the RI Pink Heals organization. All proceeds raised go straight to the charity. Our show features drinks, dinner, music, raffles, live and silent auctions, and best of all, our beautiful models are all cancer survivors! These model survivors show us what courage looks like by strutting down the runway and feeling beautiful with their hair and make-up done by a Sheila Catherine Salon. This year’s event will take place on Saturday, March 2nd, 2019 at 6pm at the Quonset O Club in North Kingstown, RI. The RI Pink Heals is a local 501(c)3 non-profit organization made up of Police Officers, Firefighters, and EMS Personnel that support men, women, children, and their families while battling ALL types of cancer. All proceeds raised are given back right to the community. The funds keep the iconic pink vehicles on the road, fund our Women’s Center in West Warwick, and provide direct care assistance to those battling cancer (pay mortgages, oil bills, food, co-pays, etc. ).